I was so excited when I recieved my AstroBrights papers. The colors were amazing and I could not wait to create something. I thought it would be fun to make a calendar for my daughter to help her learn the days of the week, months and weather. 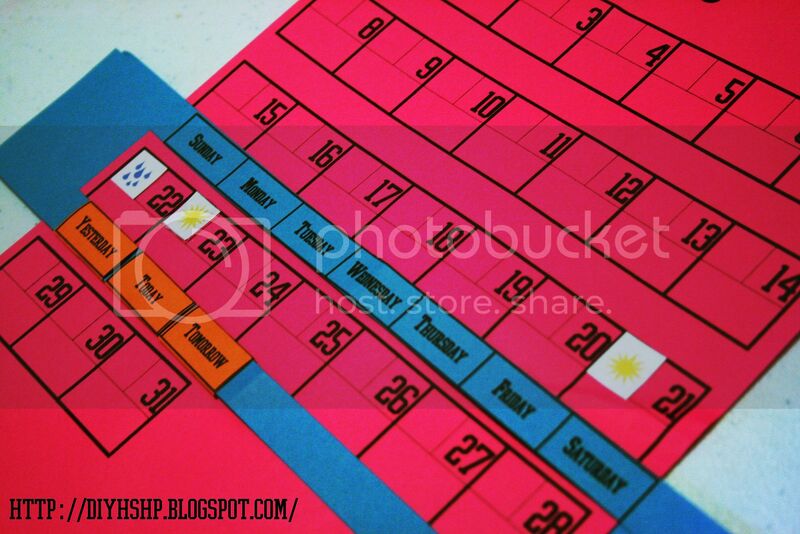 I started by making a basic calendar using open office on some hot pink paper. I printed out the days of the week on a different colored paper and cut 2 lengthwise slits the same width as the pink paper. I then printed out "today, tomorrow, yesterday" on orange paper and wrapped in around the bottom strip. I glued the orange paper together but made sure to glue it to itself and not to the blue paper. This way it can move freely across the strip under the correct day. Right now we are only working on Monday through Friday. If you would like to do Saturday and Sunday as well, you will have to cut the bottom slit about an inch longer on each side to allow the Today tab to move under those days. AstroBrights is currently having a "Give A Brighter Year" Sweepstakes. You can win a cash prize and school supplies valued at $30,000 for the school of your choice. No purchase necessary. Visit their Facebook page here at AstroBrights papers for a chance to win, and to read the official rules. The contest ends on September 10, 2012 so hurry up. It only takes a second to "Like" their page, and enter the form for a chance to win. I did, and you can too! How cool would it be to "Give A Brighter Year" to the school of your choice? Not only are they sponsoring this generous sweepstakes, but they are giving us all a challenge to create something spectacular using their paper for a chance to win more cash and prizes! . "Make Something Astrobright" design challenge encourages us all to create something marvelous using AstroBrights papers. When you do, submit your pics and video. Please share on Facebook and Pinterest with the hashtag #goastrobrights. The AstroBrights community on Facebook, Pinterest, and Twitter is a great source of inspiration. Happy back to school time everyone, and good luck with the AstroBrights sweepstakes.